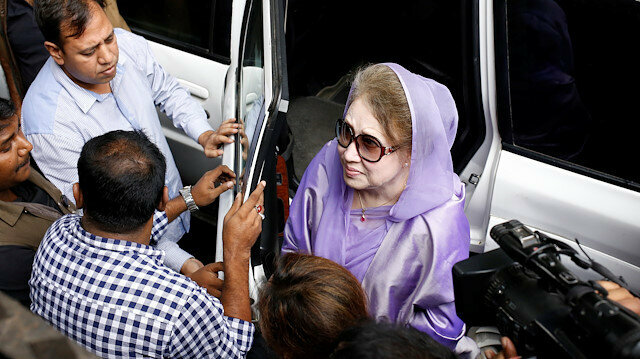 Bangladeshi opposition leader Khaleda Zia, who is seeking treatment at a hospital, was produced before a court on Thursday and sent to jail -- a move her party called inhumane. Zia, 73, widow of assassinated former President Ziaur Rahman, faces dozens of charges related to violence and corruption that her lawyers insist are politically motivated. Zia has been serving jail time for the last eight months and was admitted to the hospital on Oct. 6 following a High Court order. A UN human rights official has implored Bangladesh to shelve its plans to start the repatriation of Rohingya Muslims to Myanmar this month, fearing they may face violence or abuse. "I have not seen any evidence of the Government of Myanmar taking concrete and visible measures to create an environment where the Rohingya can return to their place of origin and live there safely with their fundamental rights guaranteed," Yanghee Lee, the special rapporteur on human rights in Myanmar, said in a statement on the UN website on Tuesday.Lee said she fears the Rohingya may face suffering, violence, or abuse as Myanmar has failed to take any tangible measures for the Rohingya's return to the border state of Rakhine in November.Facebook says human rights report shows it should do more in Myanmar"Not only did the Rohingya face horrific violence at the hands of security forces in 2016 and 2017 with no accountability, they have been subjected to decades-long systematic discrimination and persecution in Myanmar," Lee said, urging both Bangladesh and Myanmar to call off the repatriation. "I urge the Governments of Bangladesh and Myanmar to halt these rushed plans for repatriation, to ensure the protection of the Rohingya refugees and to adhere to their international human rights and refugee law obligations to ensure any returns are safe, sustainable, voluntary and dignified," she added.Persecution of RohingyaThe Rohingya, described by the UN as the world's most persecuted people, have faced heightened fears of attack since dozens were killed in communal violence in 2012.Since Aug. 25, 2017, nearly 24,000 Rohingya Muslims have been killed by Myanmar’s state forces, according to a report by the Ontario International Development Agency (OIDA).Bangladesh court sentences two to death for war crimesMore than 34,000 Rohingya were also thrown into fires, while over 114,000 others were beaten, said the OIDA report, titled "Forced Migration of Rohingya: The Untold Experience. "Some 18,000 Rohingya women and girls were raped by Myanmar’s army and police and over 115,000 Rohingya homes were burned down and 113,000 others vandalized, it added.According to Amnesty International, more than 750,000 Rohingya refugees, mostly children, and women, fled Myanmar and crossed into neighboring Bangladesh after Myanmar forces launched a crackdown on the minority Muslim community in August 2017.The UN has documented mass gang rapes, killings -- including of infants and young children -- brutal beatings, and disappearances committed by Myanmar state forces. In a report, UN investigators said such violations may have constituted crimes against humanity. Hospital director Brig. Gen. Abdullah al Harun said Zia was released after the medical board issued a discharge certificate, local Daily Star reported. The court adjourned the hearing till Nov. 14. Speaking to reporters, her lawyer Taherul Islam Touhid said Zia appeared before the court despite being ill.
Bangladesh Nationalist Party (BNP) Secretary-General Mirza Fakhrul Islam Alamgir told reporters at the prison gate that their leader was taken to jail illegally. In a news conference, party official Nazrul Islam Khan said their leader needs further medical care as doctors described her physical condition as worsening. If the treatment is interrupted, she could suffer paralysis, he added. In late October, the Bangladesh High Court scaled up Zia's jail term from five to 10 years in a graft case. In a separate case, Zia and three other party workers were sentenced to seven years in jail.